Why? Because of the Bit.ly link. Short links are bad for business. Techcrunch illustrates yet another reason. For some reason, the Deadpool people decided to give some free marketing away to bit.ly in their tweet instead of reinforcing their own brand. And they’re not alone. Tens of millions of marketers and brands are building up the brands of tracking services instead of their own by branding the wrong domains in their marketing. On that point, I have to disagree. Secondary domains are the standard solution to upgrading from short links, and they are much better for sure. But, there is only one domain that Deadpool should be branding, and that’s their website. 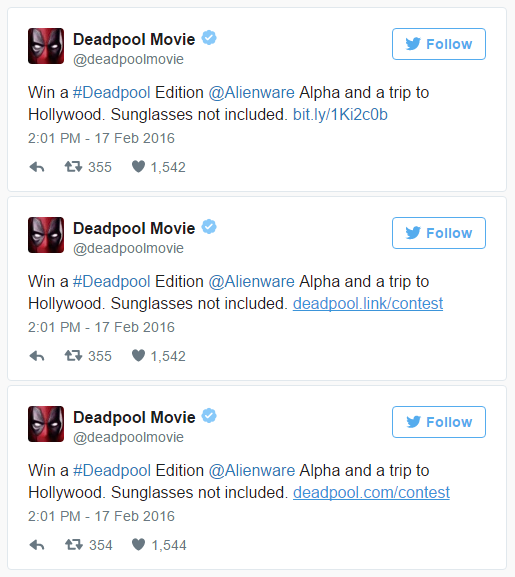 Whatever your brand, people intuitively know that domains like Deadpool.link or dp.link could be owned by anyone. In fact, the first domain TechCrunch suggested is already owned by someone else. When people see the real domain, like deadpool.com, they believe it. Looking at the links, there is only one that is obviously safe. That’s one of the reasons we built Tracker.ly. It is the only SaaS analytics service that makes links on your own websites. With our automated installer, the best branding possible is accessible from everyone from beginners to big brands.